Irish breast-feeding rates, at least at initiation, are the lowest of any major people in Western Europe or North America, with the closest second being France (1). 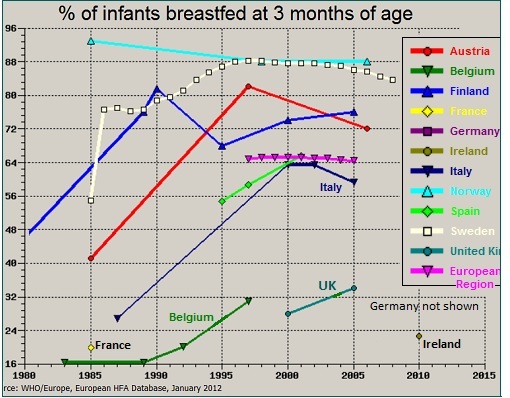 Belgian and U.K. breastfeeding rates are obviously also very low. Very high rates of breastfeeding for Norway, Finland and Sweden are conspicuous on this chart. A 2001 report for Denmark shows that country with a 99% breastfeeding rate (2) For Switzerland, breastfeeding rates are not shown here, but they are very high. According to statistics quoted in the LaLeche League’s breastfeeding data web page, Australia and New Zealand are both well into the high-breastfeeding category. The above are presented in support of the finding that the European countries with low childhood cancer rates are the ones with low breastfeeding rates, and the ones with higher childhood cancer rates all have high breastfeeding rates. Looking at a map showing rates of cancer, it is easy to see the northeastern corridor of the U.S., almost solid red, which tends to coincide with higher population density. (Fig. 4 of www.breastfeeding-and-cancer.info). The four states with the very highest population densities in the entire U.S. are New Jersey, Rhode Island, Massachusetts and Connecticut. And those states are also not hard to find in a general atmospheric pollution map if one looks closely for completely-colored-in states, indicating unusually widespread, high levels of atmospheric toxins in those states. All six of the states that fall entirely within this coastal corridor are also at the very highest level of cancer incidence, as seen in the map of U.S. cancer incidence in Figure 4 of www.breastfeeding-and-cancer.info/breastfeeding-locations.htm . 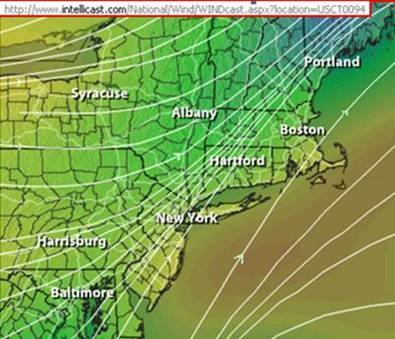 New Hampshire and Maine are not high-density or heavily industrial contributors to the pollution in this stream but they are both very much downwind on the receiving end of it, as can be seen looking north from Boston on this map. Maine has one of the higher breastfeeding rates in the U.S. in CDC surveys. This state also has very unusually large numbers of paper and pulp mills (19, most of which include the more-polluting pulp operation);(3) and Maine (along with Minnesota) has the least benefit from solar radiation among the 48 contiguous states. Its cold winters mean that levels of combustion (source of dioxins, particulate matter and PAHs) would be high, especially from residential burning of Maine's abundant wood. See the next section and also Section 3 of www.pollutionaction.org/breastfeeding-and-autism-and-cancer.htm about the disadvantages of reduced sunshine. In addition to reduced deposition of toxins, low-precipitation zones also receive more sunshine than is normal for their latitudes; this is partly because of reduced cloud cover and partly because of very little forest cover in these areas to shield the deposited dioxins from destruction by solar radiation. A greater amount of solar radiation (a) reduces formation of dioxins (by drying up HCL that would otherwise be available to provide chlorine needed for creation of dioxins), (b) shortens the toxic lives of dioxins that are present, and (c) enables the body to create vitamin D, thereby promoting immune function (more detail in Section 3 of http://www.pollutionaction.org/breastfeeding-and-autism-and-cancer.htm . Low precipitation areas (except in California) are also typically low in population density, which means less combustion of all kinds taking place, and therefore less creation of dioxins and PAHs. (1) See Figures 1.8 and 1.9; Also data provided by LaLeche League for Northern Ireland, accessed at http://www.lalecheleague.org/cbi/bfstats03.html, in line with data for Dublin area from: Public Health Nutrition. "Breast-feeding practices in Ireland", Tarrant RC, Kearney JM., School of Biological Sciences, Dublin Institute of Technology, Republic of Ireland, accessed at Proc Nutr Soc. 2008 Nov;67(4):371-80. Epub 2008 Aug 20.